In 2005, just one week before her 61st birthday, Gunhild Swanson set the 60-and-older female record for Western States with a time of 25:40. Without a doubt, her husband Jack wanted to pace her for a portion of the prestigious race, but he had recently been diagnosed with leukemia. This was her second Western States, and her fifth 100-miler. Flash forward 10 years: at age 70, Swanson runs the Javelina Jundred in 27:24. No one can say for sure, but she is possibly the oldest active female trail runner to complete 100 miles and, most importantly, she qualified for Western States again. Sadly, Jack passed away in 2008, but Swanson knows he would have been thrilled with her time and her accomplishment. “First I discovered running, and then much later on, I discovered I’m pretty good at it,” Swanson says with a chuckle. Her personality is a lot like her running: normally she is fairly reserved, but once you prime her to start talking, she can go and go and go. Her fascinating stories weave between hobbies, races and family. Originally from Germany, she has lived in Spokane, WA, for decades. She’s spry and energetic, with a warm smile, and a never-give-up attitude. She keeps her hair fairly short, and favors pastel running clothes. Besides running, her other hobbies include knitting and bragging about her grandson, Turlan. Although she was hoping and praying to get into Western States, Swanson’s race entry was originally rejected. But about a week later, she received notice that she would be entered under special circumstances. The good news gave her so much energy and motivation that she immediately hired a coach. Swanson didn’t run in high school or college, so she hired her first coach at age 70. Swanson splits her race schedule between favorite races and new races. 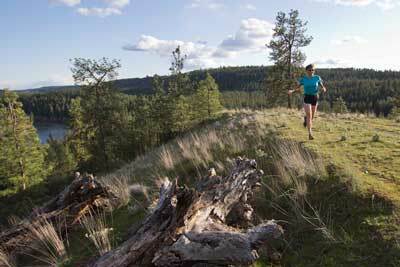 She loves popular 50k Rainshadow Running races and the Coeur D’Alene Marathon. Since Jack served on the board for the Bloomsday Road Runners Club, Swanson always runs Bloomsday—in 39 years, she has only missed two. She’s also a big fan of the Yakima River Canyon Marathon. At the 2014 YRCM, Kathrine Switzer served as the guest speaker for the pre-race dinner. During her talk, Switzer recounted her story about the 1967 Boston Marathon, when the race director attempted to shove Switzer off the course because women were not allowed to run in “his” race. Switzer’s boyfriend, Tom Miller, shoved the RD aside and sent him flying, allowing Switzer to finish. Photographs taken of the incident made world headlines, and almost 50 years later the event still resonates with many distance runners—including Swanson. After the 2014 event, the race director for the YRCM, Lenore Dolphin, graciously offered to reserve bib #261 (Switzer’s race number) for Swanson for the 2015 race, because Swanson planned to complete 260 marathons and ultras prior to it. At age 69, Swanson had already completed over 247, but completing 13 more distance races in a year was a stiff challenge. What Swanson didn’t know was that Lenore and another friend, Lisa Bliss, contacted Kathrine Switzer to tell her about Swanson’s plan and her running achievements. Switzer responded by sending a replica of her #261 bib with a personal message written on the back and a Marathon Woman bracelet to present to Swanson at the 2015 YRCM dinner. This extra special recognition truly overwhelmed Swanson, and she felt incredibly honored to be recognized by Switzer and her running friends. Without question, the 2015 Western States will be stacked with a significant field of world-class runners, course record holders and age-group masters. But Gunhild Swanson might be the grittiest runner in the pack, partly because she already owns an age group record, and partly because she will likely set another age group record.